Pre-heat oven 400F or 200℃ In a large bowl using an electric mixer, cream 1stick of butter until pale yellow and fluffy. Add in 1 cup of brown sugar until smooth. Add in 1 egg and 1teaspoon of vanilla. Sift 3/4 cup of all purpose flour, 1teaspoon baking powder and a dash of salt. Add in the butter mixture and mix well. Stir in 1/2 cup of chopped almonds. 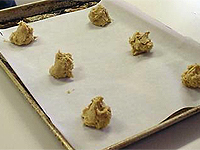 Have 2 parchment lined cookie sheets and drop the batter by level spoons fulls 2 inches apart. 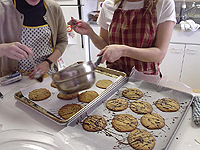 Bake until the edges turn golden but the cookie is still soft. 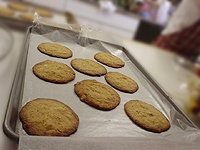 Let the cookie cool 5 minutes before transferring them to a rack to cool completely. Chocolate Glaze: Melt 6 oz of semi-sweet chocolate (chopped) into a double boiler and add 1 teaspoon of vegetable shortening. 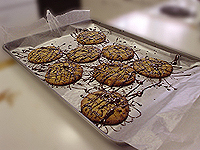 Melt till smooth and drizzle w. Let set for one hour or refrigerate for 15 minutes.